The Canadian federal government has committed to legalizing, regulating and restricting access to non-medical use of cannabis in 2018. To prepare for this change, Statistics Canada has been adapting the national statistical system to measure the social and economic implications of legalized cannabis. A new study released today in Insights on Canadian Society explores the association between frequency of cannabis use, mental and physical health, confidence in institutions, and victimization. 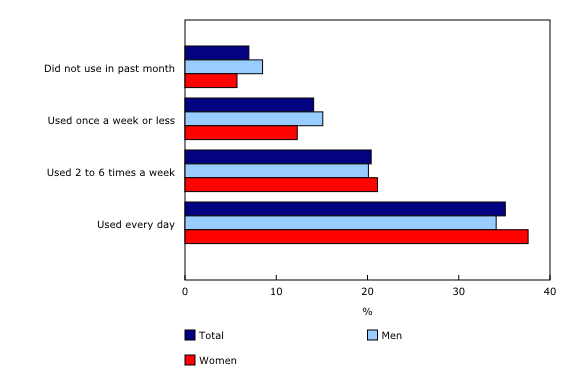 It uses data from the General Social Survey on Victimization and from the Canadian Tobacco, Alcohol and Drugs Survey. The study "Association between the frequency of cannabis use and selected social indicators" finds that one-quarter of the Canadian population had tried cannabis by age 18, and that daily users of cannabis were even more likely to have started to use cannabis at an early age. It also finds that there is an association between the presence of a physical or mental health disability and frequent cannabis use, and an association between frequency of cannabis use and other indicators, such as the level of confidence in the police or the justice system and experiences of victimization. Readers should note that the relationships between cannabis use and the indicators presented below are associations, and therefore should not be interpreted as causal. Among Canadians aged 15 years and older, 45% reported that they had tried cannabis in their lifetime. About 7% said that they had used it in the past month, and 1.5% said they used cannabis on a daily basis. One-quarter (25%) of the Canadian population said that they used or tried cannabis for the first time by age 18. That proportion was higher for men (30%) than it was for women (21%). These results are important because those who have tried cannabis at an earlier age are more likely to be daily or weekly users of cannabis as adults. Among those who said that they had tried cannabis at age 14 or younger, 31% reported that they currently used cannabis on a weekly or daily basis. By contrast, among those who first tried cannabis when they were 16 or over, less than 13% said that they currently used this substance on a weekly or daily basis. Past literature has found a link between cannabis use and health. This relationship, however, does not imply that cannabis use leads to detrimental health conditions. Rather, it could mean that individuals who have health issues use cannabis to alleviate their symptoms. In this study, two self-reported measures are used: presence of a physical disability and an emotional, psychological or mental health disability that sometimes limits daily activities. The results show that there is a link between the presence of a physical or mental health condition and the frequency of cannabis use. This was especially the case for women. For instance, 43% of women who used cannabis on a daily basis reported that they had a mental health disability that limited their daily activities, compared with 7% among women who had not consumed cannabis in the past month. Among men, 11% who used cannabis on a daily basis reported that they had a mental health disability, compared with 4% of men who had not used it in the past month. People who reported using cannabis frequently also reported having lower levels of confidence in key institutions such as the police or the justice system. For instance, among people who said they use cannabis on a daily basis, 38% of women and 34% of men had low confidence in the police, compared with 6% of women and 9% of men who did not use cannabis in the past month. These results hold after controlling for differences in age and household income. Furthermore, 46% of women who used cannabis on a daily basis had lower levels of confidence in the justice system, compared with 21% of women who did not use cannabis in the past month. Among men, the relationship between cannabis use and confidence in the justice system was not statistically significant. 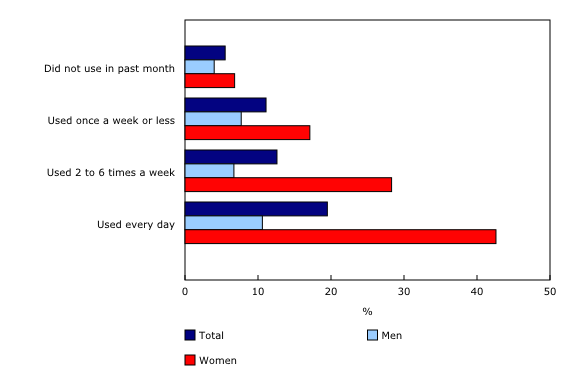 Frequent use of cannabis is also associated with higher victimization rates, even after accounting for other factors associated with victimization, such as personal characteristics, self-reported mental health, neighbourhood characteristic variables, and other lifestyle measures (including alcohol consumption and other illicit drug use). More frequent users of cannabis are more likely to report harmful effects from cannabis use. For instance, 8% of people who use cannabis on a weekly or daily basis said they once tried unsuccessfully to control, cut down or stop cannabis use, compared with less than 4% among those who used cannabis on a monthly basis or less. Although fewer than one in five people who said they used cannabis consumed it in conjunction with other illicit drugs such as cocaine, speed/methamphetamine, ecstasy, hallucinogens, heroin, inhalants and salvia, those who did were more likely to report harmful effects from drug use in general. For instance, among those who used cannabis and other illicit drugs in the past year, 21% reported that they had suffered physical harm due to drug use, compared with 5% among those who used cannabis only. Similarly, 15% of people who used cannabis and other illicit drugs said they experienced harm to their friendships, social or home life and marriage, compared with 3% for those who only used cannabis. This study uses data from the 2015 Canadian Tobacco, Alcohol and Drugs Survey (CTADS) as well as the 2014 General Social Survey (GSS) on Canadians' Safety (Victimization). The target populations for these two surveys include the non-institutionalized Canadian population aged 15 and over living in the provinces. The data for CTADS were collected throughout the 2015 calendar year, while the GSS data collection period was throughout the 2014 calendar year. The definition of cannabis products was similar in both surveys. In the CTADS, however, frequency of use refers to usage in the past three months, while usage over the past month is examined in the GSS. In the 2015 CTADS, the wording used is as follows: "The next questions are about cannabis. In this next series of questions when we use the term marijuana, we mean the use of marijuana, hashish, hash oil or any other preparation of the cannabis plant." The following questions were used: (1) During your lifetime, have you ever used or tried marijuana? (2) Have you used marijuana just once or more than once? (3) During the past 12 months have you used marijuana? (4) During the past three months have you used marijuana? (5) During the past three months how often did you use marijuana? (6) How old were you when you tried or started using marijuana? In the 2014 GSS, the wording is as follows: "The following questions ask about the use of drugs. Please do not include medications that are taken (on a doctor's prescription) or bought over-the-counter." The following questions were used: (1) In the past month, did you use marijuana, hashish, hash oil or other cannabis derivatives? (2) How often in the past month, did you use marijuana, hashish, hash oil or other cannabis derivatives? The article "Association between the frequency of cannabis use and selected social indicators" is now available in Insights on Canadian Society (Catalogue number75-006-X).